When your six personnel present attempt a mission, subtract one from the number of dilemmas your opponent may draw and one from the total cost he or she may spend on dilemmas. "All those away missions, wind, dry air. The elements really are harsh on the hair." 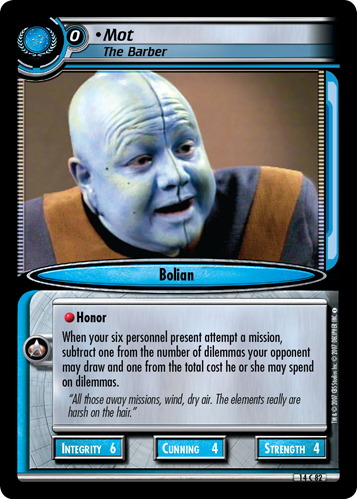 Characteristics: reduce opponent's abilities to play dilemmas, affiliation, Next Generation related, Bolian species. This card has an erratum: Condition changed. Game text without errata: "When your six personnel present attempt a mission, if there are two or less dilemmas beneath this mission, subtract one from the number of dilemmas your opponent may draw and one from the total cost he or she may spend on dilemmas.". Taken form Current Errata 2015-04-06. There are 6 entries for Mot, The Barber (ST2E 14 C 82) at the Tradeplace (22 haves and 2 wants). Click here to see all trade list entries for this Common card! Also see here for all trade lists with any card fom "What You Leave Behind".